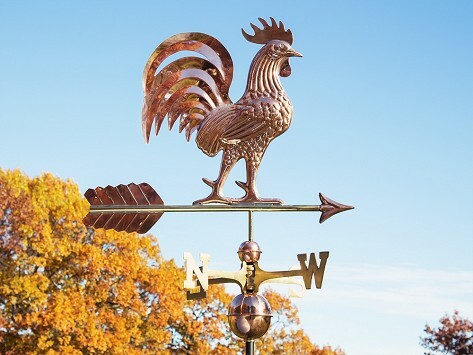 A copper weathervane is a classic way to make a house-proud statement. Beginning with original sketches by American artists, each heirloom-quality weathervane is handcrafted in India with beautiful copper that will patina over time. Featuring solid brass directionals, the weathervane is balanced to spin easily in the wind and guaranteed to last a lifetime. Dimensions: Eagle: 26" x 25" x 2"; Rooster: 26" x 22" x 2"; Horse: 33" x 15" x 2"; Buck: 33" x 23" x 4"; American Flag: 31" x 15" x 2"; Ship: 24" x 27" x 5"; Bass: 36" x 15" x 3"
Weight: Eagle: 13 lbs. ; Rooster: 13 lbs. ; Horse: 14 lbs. ; Buck: 14 lbs. ; American Flag: 16 lbs. ; Ship: 16 lbs. ; Bass: 17 lbs. I bought this for a gift for my brother. It was the large bass weathervane. He loved it! It was well made and beautiful!!!! Absolutely love the weathervanes. Just one of many great products on Grommet.